In Ramboll, our Stakeholder Intelligence service empowers decision-makers to acquire and apply insights about stakeholders to drive transformational actions. What if you worked in an organisation where leaders were able to make decisions and discuss progress based on firm intelligence about key stakeholders, combined with insights on must-win battles such as customer churn and top-line growth - easily visualised in real-time of course? A nirvana for most organisation but technically doable and more than feasible in economic terms. 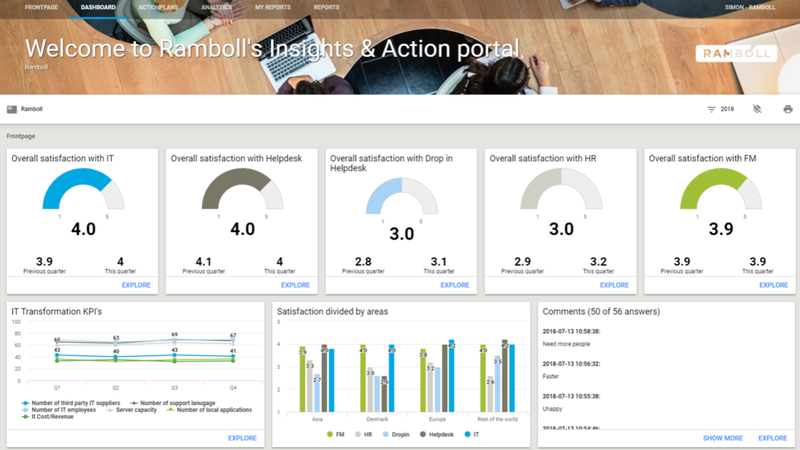 For this, Ramboll Management Consulting offers clients best-in-class support to improve insights and therefore the quality of decision-making. Our stakeholder intelligence unit comprises more than 130 experts serving both local and international clients from four countries. A key concern for most executives in a transformational world is to identify areas of improvement or pinpoint high performance that must be nurtured to stay competitive. This goes for private as well as public sector organisations. Essentially, stakeholder intelligence is all about acquiring, presenting, and applying relevant knowledge about relevant stakeholders at the right time. As the word suggests, a stakeholder is anyone with a stake in the company; employees, users, customers, suppliers, citizens, public parties, NGOs, etc. Stakeholder intelligence is anything from frequent pulse surveys and insights on employee engagement, over instant ratings on customers’ willingness to recommend, to a UN SDG self-assessment tool that hoovers up industry data and company performance data. 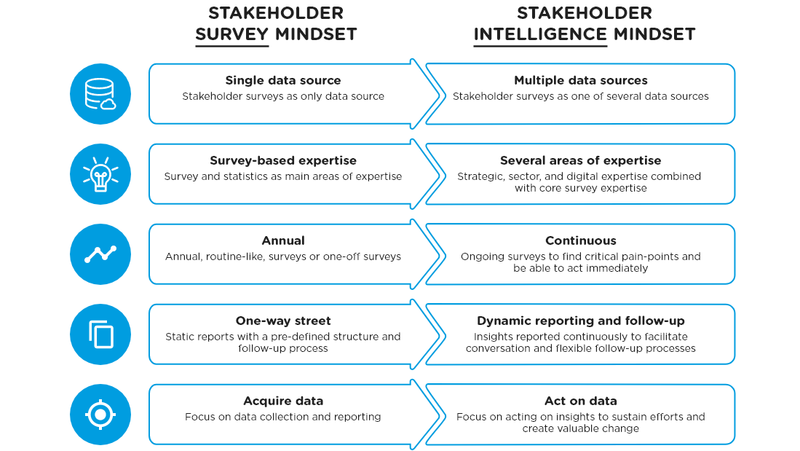 With an excess of information available, stakeholder intelligence is the cross-road where data and technology meet actionable insights that can drive behaviour. For some organisations, the problem is not the amount of data – it is merely the lack of integration and ability to act on the insights collected. Based on a strong survey heritage influenced by global trends like big data, data source integration, real-time visualisations, and simplicity design, we help clients be fit for the future and apply the right intelligence about key stakeholders. In doing so, we help clients gradually move from a stakeholder survey approach to a stakeholder intelligence thinking that drives the biggest returns. This is summarised in the below model. Click to enlarge. This model shows the gradual transition from classic surveying of one stakeholder group once a year to a dynamic stakeholder intelligence approach that the most progressive organisations apply. The end goal is enhanced ability to keep acting on the core insights generated. For more than three decades, millions of people have participated in a multitude of stakeholder surveys. As a natural consequence, we have gained vast experience in handling even the most complex projects, in both public organisations as well as private corporations with international presence and volume. We are repeatedly trusted by clients due to our best-in-class platform which is technically superior at the edge of innovation and - equally important - live up to the highest security standards. On top of this, the user interface is easy and swift with all designs based on Google Material Design. Our easy-to-use dashboard solution displays live data in a simple and manageable way, equipping decision-makers with the right knowledge and the ability to apply the right actions depending on their organisational role. Click to enlarge. Use our dashboard solutions to gain actionable insights to your most important KPI’s. You can create multiple dashboards customised for specific people or organisational levels. Our portfolio of clients spans from the simplest DIY-surveys to big nation-wide surveys handling up to 500,000 respondents at once. At the end of the day, our clients’ challenges set the bar for what we can achieve together. For instance, we are able to handle sensory city data integrated with public health data, and help clients create custom-made live data on key stakeholders paired with e.g. financial performance, customer churn, or risk and safety incidents. Unlike other vendors, we do not only offer knowledge on the actual survey. As a multi-disciplinary consultancy, we offer specialist competencies within a number of industries and sectors, such as digital strategy and architecture, implementation and follow-up processes or GDPR legislation. Just to name a few. Whatever the need, your objective marks our starting point as we take pride in designing each project according to your unique situation and strategic ambition. One of Denmark’s largest energy providers, Eniig, had the ambition of becoming even more customer centric in their thinking and approach to customers and markets. Developing and measuring educational quality is a multi-facetted affair. This is true for public-sector executives who need to oversee progress, for local leadership who needs to priorities under budgetary constraints and for teachers tasked with creating inclusive learning environments for kids and youth. The amount of data is exploding, and companies collect increasingly more data about their customers. But more data alone doesn’t spell success. Success lies in getting greater insight about your stakeholders and that’s something you can get without needing more data. Learn how in this expert column. Engagement at work matters. Yet a recent Ramboll study shows some alarming numbers about companies’ ability to retain employees. On top of this, the study provides guidance for leaders eager to boost engagement. 130 experts in Stakeholder Intelligence assist on everything from local projects to global data collection assignments across 20+ countries. We thrive in complexity, so that our clients do not have to. We come up with the best ideas to address our client’s most complex challenges. Technology enabled but always with a human touch. We are preferred by clients for our round-the-clock support as we are only a ring away. Our IT platform is considered the most reliable and safe in the market. We constantly improve features, design, and user experience to stay on top of trends.